One woman's search for the truth of her sister's disappearance leads her to deceit and danger in 1893 Chicago. Rosalind Perry has left her family's rural farm in Wisconsin to work as a housemaid at Sloane House, one of the most elegant mansions in Gilded Age Chicago. However, Rosalind is not there just to earn a living and support her family---she's at Sloane House determined to discover the truth about her sister's mysterious disappearance. Reid Armstrong is the handsome heir to a silver fortune. However, his family is on the periphery of Chicago's elite because their wealth comes from 'new money' obtained from successful mining. Marriage to Veronica Sloane would secure his family's position in society---the lifelong dream of his ailing father. When Reid begins to realize that Rosalind's life may be in danger, he stops thinking of marriage prospects and concentrates on helping Rosalind. Dark things are afoot in Chicago and, he fears, in Sloane House. If he's not vigilant, Rosalind could pay the price. 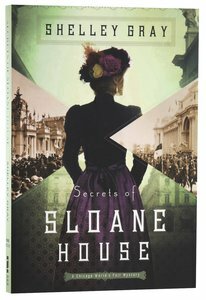 Set against the backdrop of Chicago's Gilded Age and the 1893 World's Fair, Secrets of Sloane House takes us on a whirlwind journey of romance and mystery. About "Secrets of Sloane House (#01 in The Chicago World's Fair Mystery Series)"
Customer Reviews For "Secrets of Sloane House (#01 in The Chicago World's Fair Mystery Series)"
I really liked this book and am so glad I own it!! It's got mystery, suspense and romance all in one. There really are a lot of secrets and unless you analyse each character deeply, you might, just might, be able to guess who is holding the biggest secret of all. I love the characters and how much personality they have. You know straight away whom you should befriend, hold reservation for and avoid. I can guarantee that after a few chapters you will be hooked. You will love Rosie, who has a beautiful, caring and loving nature despite the way society is treating her. So pick it up. You won't be disappointed. I enjoyed this latest novel by Shelley Shepherd. I listened to the audio version read by Tavia Grey. It focuses on a young woman searching for her missing sister and finding employment within the house that she worked at previously. The story holds the readers attention throughout, and combines many twists and turns not expected. I appreciated the historical nature of the book, and the colourful background Shelley weaves throughout. I also enjoyed the glimpses of upstairs and downstairs life experienced by each character. Serious themes are explored within the novel, that give it a more realistic edge. Overall, a very good book and i recommend it for lovers of historical fiction and mystery.